You know when you buy something then it ends up in the bathroom cabinet right at the back and you forget you have it? Well that’s exactly what happened to this lipstick! Tidying my make up a few weeks back I stumbled across this beauty, hadn’t even used it before! I’m now addicted. It’s an electric pink colour and it’s the brightest pink I own. It feels lovely when you apply it, but then all MAC lipsticks do! It’s a creamy texture with a matte finish. Sometimes lipsticks dry your lips out, but not this one, it almost feels like you are wearing lipsyl it’s that moisturising! The pictures don’t do it justice. It’s one of those lipsticks you look at and ask yourself, can I pull it off? Surely it will come off after you eat? In my opinion everyone needs a bright pink and a bright red lipstick in their collection 🙂 I can put this on in the morning and it’s still there at the end of the day without reapplying after meals. For those of you interested it’s MAC and the shade is CANDY YUM YUM. 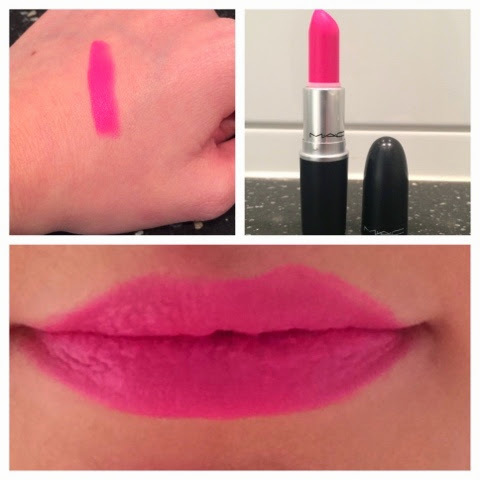 It’s a matte lipstick but it also looks great with a pink or clear gloss over the top! The question is, can I brave it and buy a blue lipstick next?! Thanks so much for the follow on bloglovin! I really like this pink color, and especially love when you're basically able to just shop your own medicine cabinet!